What does the Chinese legislation say? Xinjiang's new legislation is the first detailed indication of what China is doing in the region. It says examples of behaviour that could lead to detention include expanding the concept of halal - which means permissible in Islam - to areas of life outside diet, refusing to watch state TV and listen to state radio and preventing children from receiving state education. China says its network of detention centres will also teach Mandarin Chinese, legal concepts and provide vocational training. Rights groups have criticised the move. Sophie Richardson from Human Rights Watch said the "words on paper outlining grotesque, vast human rights abuses don't deserve the term 'law'". Is China cracking down on Islam? 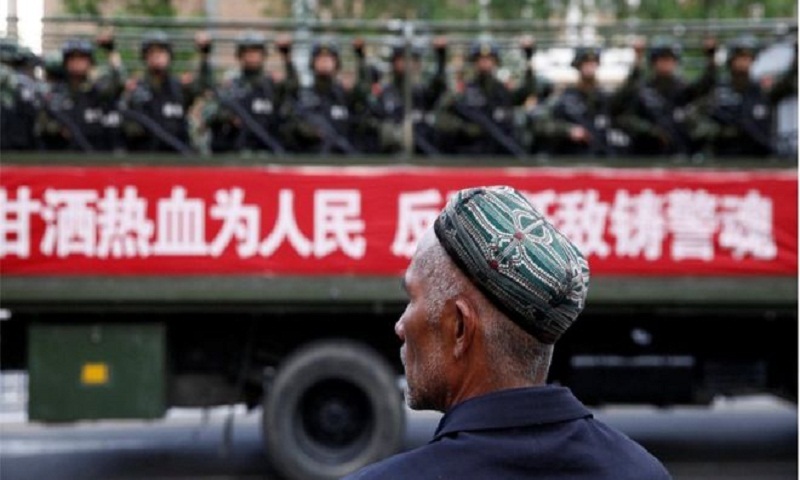 China is also launching a wider campaign against Islamic practices across Xinjiang. It wants to stop the use of halal products that are not food. One newspaper said the use of the term halal to describe items such as toothpaste blurred the line between religious and secular life and made people prey to religious extremism. On Monday Communist Party leaders in the regional capital Urumqi led cadres in swearing an oath to fight the "pan-halal trend", AFP reported. New regulations also make it clear that Muslim women are banned from wearing veils. Communist party members and bureaucrats have been told to speak Mandarin Chinese in public and not local languages. Former prisoners of the camps have told the BBC of physical as well as psychological torture there. Entire families had disappeared, they said. In July, a former teacher at one of the camps who fled to Kazakhstan told a court there that "in China they call it a political camp but really it was a prison in the mountains". The New York Times quoted former detainees as saying that they were forced to sing songs such as "Without the Communist Party, There Would Be No New China" and those who could not remember the words were not given breakfast. "In the end, all the officials had one key point. The greatness of the Chinese Communist Party, the backwardness of Uighur culture and the advanced nature of Chinese culture," former detainee Abdusalam Muhemet told the newspaper. The World Uyghur Congress said in a report that detainees were held indefinitely without charge, and forced to shout Communist Party slogans. However China's state-run English-language Global Times newspaper maintains the tough security measures in the region have prevented it from turning into "China's Syria" or "China's Libya". The Uighurs are ethnically Turkic Muslims mostly based in Xinjiang. They make up about 45% of the population there.